Thursday, November 7, 2013 • 6:00 p.m.–10:00 p.m. Explore your inventive side and celebrate the Tinkering Studio’s new book, The Art of Tinkering, featuring 150 artists and makers. Tinkered attire is strongly encouraged. The Art of Tinkering is here! To celebrate this essential introduction to the seriously playful world of tinkering, we’ve invited makers featured within and without its pages to share their projects with you. Look for artworks, films, and activities throughout the museum, and engage your manual curiosity with a wealth of tinkering tools and materials. Meet with makers working at the intersection of science, art, and technology, and get inspired to tinker. That is: to go forth, get stuck, get ideas, and ultimately gain insight into the way things work—on your own terms. 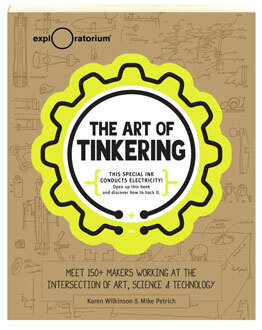 The Art of Tinkering was coauthored by Karen Wilkinson and Mike Petrich, Codirectors of the Exploratorium’s Tinkering Studio. Learn more about the Tinkering Studio and its team. Plus many, many Exploratorium exhibits!